This entry was posted in books, experience, subjectivity and tagged book review, books, experience, subjectivity. Bookmark the permalink. hmm …. I don’t know …. 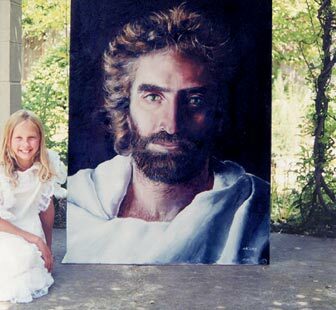 while I love the picture of Jesus, yet it looks exactly like a picture of Bruce Marchiano as Jesus in “Matthew” (check out his web site). Mind you, when I saw the movie, and read Bruce’s book of the making of Matthew, what occurred to me were that at times Bruce/Jesus look very much like the ancient E.Orthodox frescoes of Christus Pantocrator. What did the Spirit say to you while you were reading the book? I am not sure I sensed the Spirit specifically speak anything to me about the book, per se. But, as I tried to share in the review of the book, I don’t believe this book is bad, dangerous, nor heretical. I would be very willing to say I believe Colton truly experienced these things, even meeting Christ in the vision/near death. When you read something (or listen to, or watch) …. sometimes the Spirit says “yes … that is true” …. sometimes … “No! God is not like that” …. I saw no end of them. * Colton gives a description of visiting the biblical “New Jerusalem” and calls it “heaven”, and no-one saw fit to correct him while there. * Angels have swords to keep Satan out, in spite of the fact that Job teaches that Satan currently has access to God’s throne. * Colton asked if he could play with swords, and Jesus said no, it’s too dangerous, in spite of the image of heaven’s gates as never being closed because it is a place of complete safety. * Colton described disappointment and being dejected when he was not allowed to play with a sword, as if we will be disappointed in heaven, and not content with whatever it is we find ourselves doing—which primarily seems from scripture to be related to worship of God, which seems strangely lacking in the book. * Colton described Jesus’ horse as rainbow coloured, in spite of the scriptures describing Christ as riding on a white horse. * Colton describes Jesus “shooting down” the Holy Spirit’s power, in spite of the Holy Spirit being described as a unique and separate person within the Godhead, with, ostensibly, his own will and activity. I am not saying this little boy is a liar, or that his parents are deliberately creating a fabrication, or intentionally leading him, but I find many of the claims as not only extra-biblical, but in opposition to revealed scripture. A more likely scenario, to me, seems to be some kind of experience, perhaps a hallucination caused by the fever or medication, perhaps a genuine vision or spiritual revaluation, which has been embellished and elaborated on over time by a child who wishes to please his parents. I am reminded of the elaborate and detailed stories told during the McMartin trials, none of which have ever been substantiated, due solely to unintentionally leading questions, and the children’s desire to please adults. So often, the so called revelation and recollection came only after some leading, for example the Angels with swords came after the family watched the Lion, the Witch and the Wardrobe together and his mother asked if there were swords in heaven, to which Colton replied in the affirmative (I recall no situation in the book where Colton disagreed with a suggestion of his parents, or offered up information contradictory to that which they implied to him) before elaborating on the suggestion, exactly what one would expect from a child being lead towards a specific response by leading questions. Had this description happened, for example, to someone with no theological background, no knowledge of God, or only knowledge of a different god, it may be more convincing, but Todd Burpo is a pastor. Yes, Colton was only Four at the time, but you would be amazed at what children pick up. Every night, I pray with my two year old daughter and we ask Jesus to look after her, keep her safe, and help her to love him more. Regularly, this little girl goes on to describe in vivid detail how she thinks he is lovely, how he is a great friend, and how she loves to play with him, and how he looks after her, and how she likes to cuddle him. One could suggest that this is simply that children are more attuned to the spiritual world than adults are, and my daughter is regularly having real meetings with Jesus, but at the same time, she also describes how he is scared of spiders, and my daughter (who likes spiders) had to rescue him from them, how he uses his magic wand to make people better and other claims which seem to invalidate this as a real, literal experience. I am not saying that some of the experience—The holy spirit’s presence around her in our house as she sleeps, for example—is not real, but at the same time, there are things in there which simply do not ring true, and so I don’t go around claiming it as a true religious experience that all should be encouraged by. 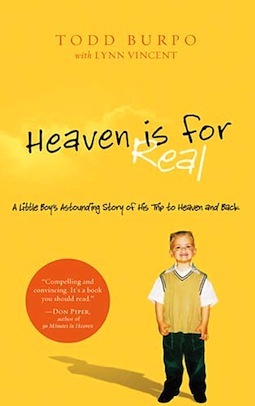 I find it hard to imagine that Colton would have never heard his pastor-father saying the core many, if not most of the things which he then claims to have seen in heaven, either from the pulpit, or in his home. All in all, I think that a lot of the concerns levied against this book, and those like it, are legitimate, and time spent reading it would be much better spent studying what the scripture actually says about most of these things.